CONSTRUCTION SEQUENCE - LIGHT GUIDING SHADE. aluminium frame – pot rivet the Colorbond and reflective end plates to the aluminium frame. STEP 2. Pot rivet the top flange to the aluminium frame. STEP 3. Adhere reflective aluminium sheet to the "twin wall" polycarbonate cover. 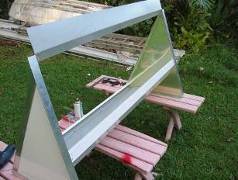 Fix the "twin wall" cover to the shade using L section aluminium pot riveted to the frame. Spring the bottom reflector sheet into the "colorbond" base. An clear output aperture cover (not shown in Fig 3) is then attached. STEP 4. Completed product. Note the top part of "twin wall" cover is painted white with acrylic roof paint and the lower part of cover is left clear to act as the input aperture for sunlight. Note L section aluminium pieces used to retain the cover and L section frame for fixing to the wall or window sides.